This week Street Charts roundup: Touchless and Spice featured with the hot new collaboration of the week. Nego Hights featured as new reggae artiste to watch. 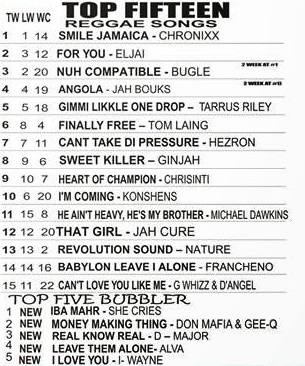 Sanchez featured as hot reggae artiste to watch while Chronixx remains at the number one reggae spot with the hit single ‘smile jamaica’. QQ remains at the number one dancehall spot with the hit single ‘one drop’. Featured as single of the week is a brand new reggae single by Nego Hights ‘Diamond in the Rough’ produced by Dove Muzik. This week’s Street Charts features one new entry. 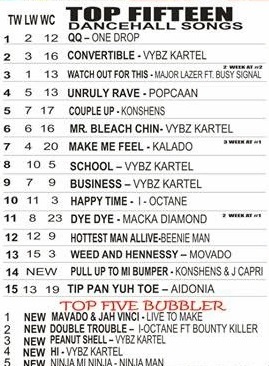 Konshens and J Capri enter the Dancehall chart on number 14 with their single “Pull up to mi Bumper”. Check out the full listings below.